Why do we love playing with our children or our grandchildren? Because they remind us of what it felt like to be young. Why do we love to admire Samuel Thomas’ paintings? You may not have discovered the artworks of this Norfolk artist, but Samuel Thomas’ paintings rekindle our childhood vision of the world. His pop-art inspired paintings are joyous celebrations of the world around us, these are not backward looking pastiches’ but aspirational projections of the self into a better future. 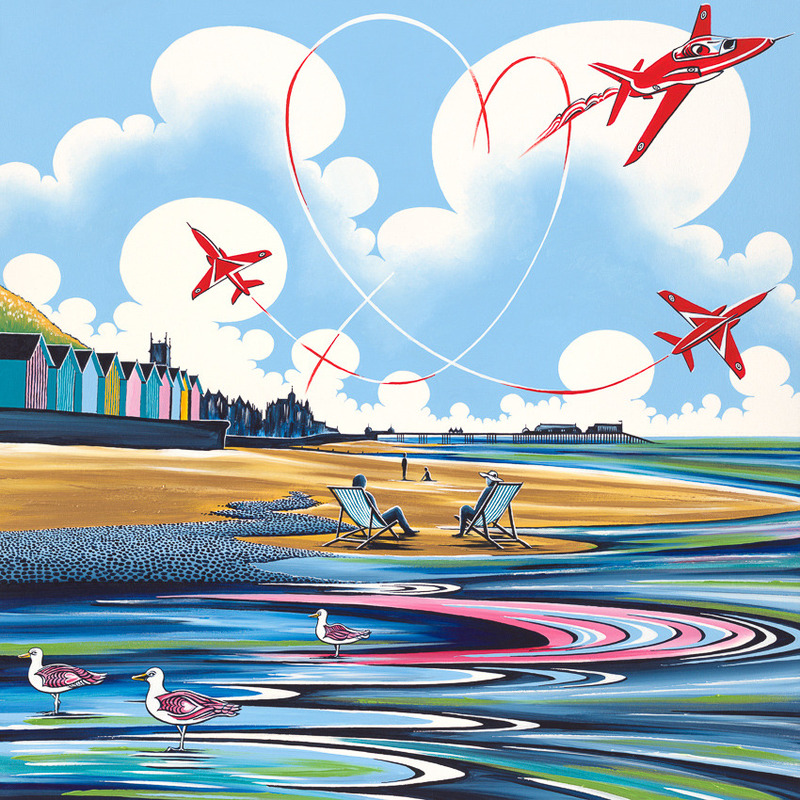 The artist uses his Norfolk surroundings to capture scenes including the iconic RAF Red Arrows painting the skies with a giant love heart to mesmerising sunsets that have a dreamy quality within them. Being young is often a state of mind – a state of mind that is embodied within these paintings. We can rekindle and rediscover our sense of wonder and amazement of the world around us when we lose ourselves in these euphoric paintings. Samuel Thomas, 29, admits he is a bit of an old soul at heart, but he embraces this element of his personality and admits it’s this quality that inspires him to paint the world around him. ‘Sometimes words just don’t do the story justice – and only a painting will do’ exclaims the artist. As children our imaginations are wild, our ideas are limitless, our energy is boundless, nothing is ever off limits. Samuel Thomas is a natural observer of the world, and he finds it fascinating to watch the world around him and respond to it in his own unique way. As we grow older we become fixated on the quest of building the perfect life for ourselves, but in doing so we in fact make life harder for ourselves. We are so preoccupied with rushing around and stressing out over our frenetic routines that we sacrifice the present moment being preoccupied with the future prospect of improving our lives and positions in some way. In doing so we are missing out on the very thing we have in front of us – the right here, right now. How ridiculous is it that people plan to visit a music concert months in advance, and work extra shifts and skip family commitments to get the money together for it. When the experience arrives – it’s not an uncommon thing to see herds of people skipping the last 20 minutes of the concert because they want to beat the mad rush of traffic at the end. This kind of behaviour can be extended to the way we live our daily lives and we miss out on so much because we are always pre-occupied with what’s around the corner. We are hardly ever contented because we are always striving for something - but what? Sometimes all we need to do to realise how perfect our lives actually are is to slow down and appreciate exactly what it is we are experiencing. This is what Samuel Thomas aims to do with his paintings - to remind people of how much there is to celebrate in their lives already. Samuel says that admirers of his artwork often question him ‘why is the sea pink?’. But it’s not unusual for the sea to be pink – during a sunset for example. The problem is people just never take the time to slow down and really look and appreciate the world around them – and this can often be the fundamental problem. People miss out on so much and they don’t even realise it. 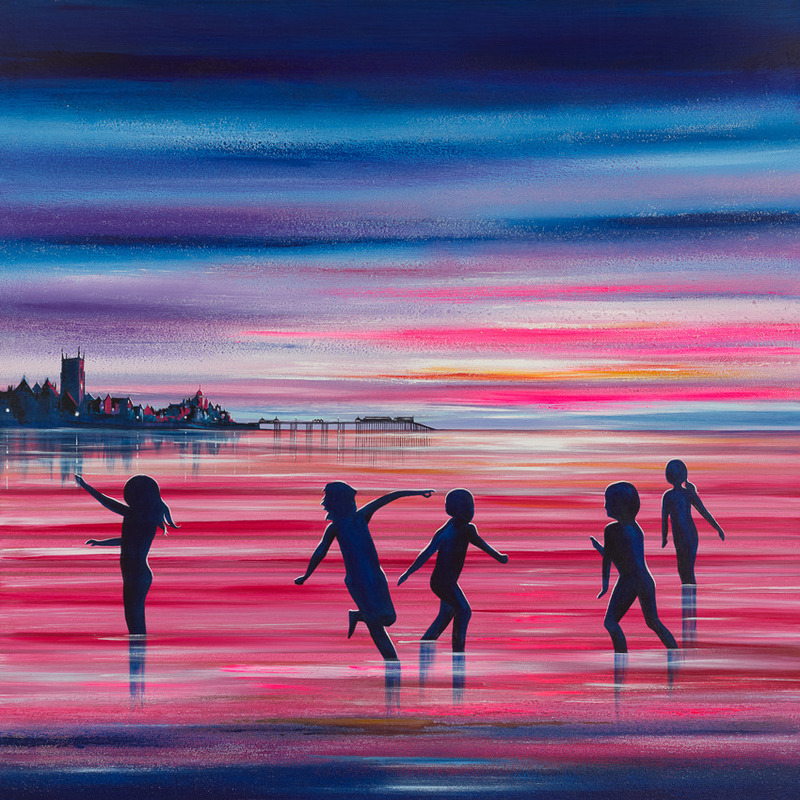 My paintings exist on many levels; as beautiful dreamlike scenes, to exploring escapism we all long for and portraying the world as seen through the eyes of a child that is a wild and limitless. The artworks aim to capture that overwhelming feeling that washes over you after watching a profound life-affirming film. We all know that life is rarely perfect, and the pursuit of perfection is a pointless one, because as human beings we are rarely ever contented with what we obtain. But Samuel’s paintings encourage us to appreciate how perfect our lives already are. The spirit and atmosphere in each original is unique, capturing for eternity a brief moment in its perfect state. Another concept Samuel is fascinated by is nostalgia and as we grow older our sense of nostalgia grows stronger and stronger. Moments we once never knew were so precious become golden memories we long to re-live in some way or another. Time slips away faster and faster as we grow older, trying to hold onto time is as pointless as trying to hold onto sand in our hands without it slipping through our fingers. ‘Nostalgia’ is a painting that encapsulates this idea and was created using real sand collected by the artist as walked his local beach one evening. The appeal of Samuel Thomas ‘ artwork transcends and appeals to many generations due to the diverse range of artistic influences that run through each piece. 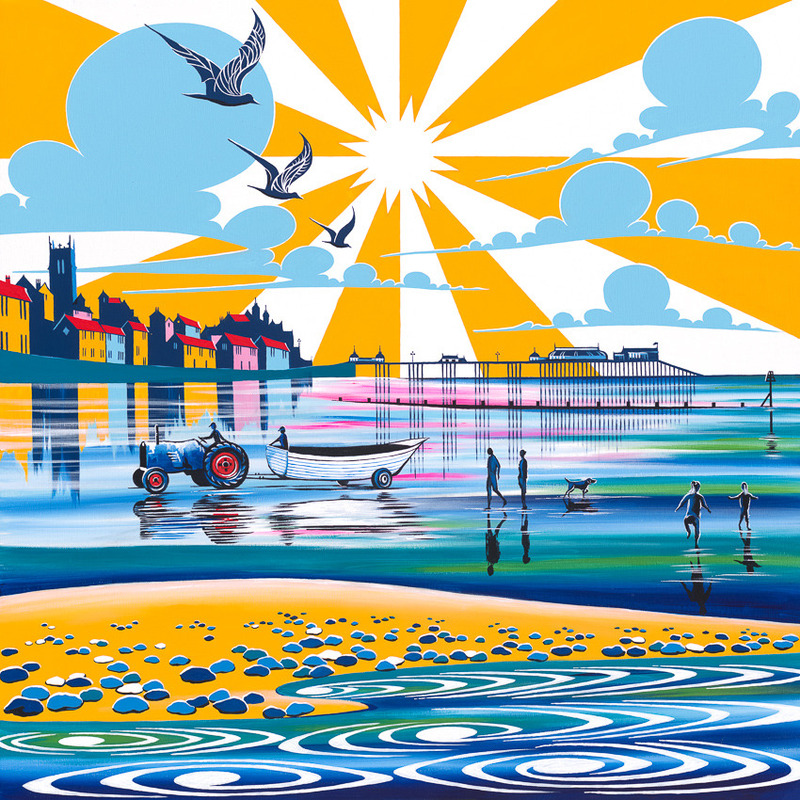 The artist’s signature painting style is reminiscent of the ‘come to the seaside’ railway posters from the 1920’s with elements of stylised art deco patterns. In addition to this you can also see a fusion of 1960’s psychedelia to pop art of the 1950s resulting in artwork that has a sense of nostalgia and timelessness.